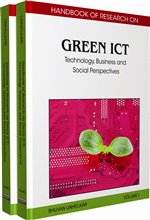 An important factor in green ICT challenges is to reduce the creation and emission of green house gases by all means. This chapter is concentrating on how telecommunication network operators could operate in a very much more environment friendly way by co-existing with their fellow operators by way of sharing infrastructure such as towers and power generators which will reduce the emission of green house gases. The chapter has described the impact and the magnitude of telecom infrastructure on the environment and the ways that can be practised in order to reduce the emission of green house gases. There is currently a worldwide concern about global warming caused specifically by the CO2 fuelled greenhouse effect and the role that pollution plays in weather and environment. Some scientists say global warming is also intensifying naturally depicted through extreme weather patterns like typhoons, floods, severe droughts, changes in sea levels and marine biology (Lu, H. 2009). Telecommunications is an essential component of development in today’s context and has one of the highest growth rates in the world. Therefore, “green” movement in the telecom industry is essential to us all. As energy prices soar, telecommunication network operators are even more motivated to scrutinize their expenditures and evaluate their environmental and social responsibilities. In practice, the energy usage can be calculated into CO2 emissions. One kilowatt-hour can be converted into about 0.658 Kg CO2 emission (In-stat. 2009). Our main focus in this chapter would be to look at how base stations in the telecommunication networks could be made greener so that environment will be cleaner for the future generations. Aside from the energy usage closely associated with the operation of base station equipment, the use of other resources and materials can also be calculated by the emission of CO2. The consumption of raw materials and field-consumption can be converted into CO2 emission as follows. Material usage refers to the energy used to produce the steel and concrete to build the base stations, which can be converted into CO2 emissions. The decrease of forest area brought about by the field consumption of base stations can also be converted into CO2 emissions. (In-Stat. 2009). To assume one normal base station can be used for 5 years, the gross emissions would be 211 tons of CO2. One-time consumption of raw material or field occupation can be calculated into CO2 emissions, and then distributed across a 5-year cycle. As illustrated in Figure 1, the total CO2 emission volumes can be broken down by operation energy usage (including main equipment, ancillary equipment, and other equipment) and the one-time consumption (raw material and field occupation).